Over the course of nearly half a century, Robert A. F. Thurman has left an indelible mark on numerous fields of study, including Buddhist literature, Tantric Buddhism, Tibetan Studies, and the comparative sciences of mind. To celebrate his seventieth birthday, Thurman's students and colleagues have come together to pay tribute to these contributions and to Thurman's ongoing leadership in these fields by assembling a collection of essays of their own that extend and supplement his groundbreaking research. 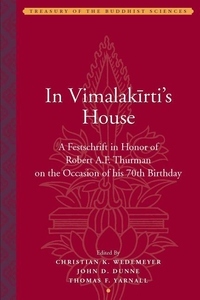 In Vimalakirti's House is the result of this collaboration and represents a broad spectrum of cutting edge studies in areas central to Thurman's own scholarly project. The resulting volume is itself a kind of "treasury of the Buddhist sciences," insofar as its authors explore wide-ranging problems in art, literature, epistemology, history, ritual, buddhology, and lexicography.